Createspace Independent Publishing Platform, 9781720468554, 48pp. 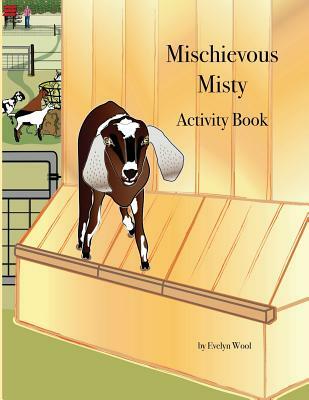 The Mischievous Misty Activity Book is a companion to the children's book, Mischievous Misty. The original story book is the true and "absolutely delightful" (--Greg L., Florida) story of a curious little dairy goat who lives in The Meadow on Gram's farm. Misty loves to be near Gram and must know what she is doing at all times. When Gram carries a water bucket through The Meadow, Misty tries to see what's inside and spills water all over Gram. When Gram tries to pour feed into the trough, Misty tips the pail over and spills grain all over the ground. Each time Misty gets into a tangle, Gram patiently tries to figure out how to prevent future mishaps. In this activity book, children are invited to illustrate their own version of Misty's story by coloring pages and completing a variety of puzzles, including mazes, word searches, connect-the-dots, criss-cross, and more. Evelyn Wool spent numerous childhood vacations on a real working farm. When her own children were grown, she began to reminisce about the smell of hay and horses, the sight of cows marching into the barn, and the taste of slurping juicy peaches right off the tree. In 2014, Evelyn and her husband, Robert, moved from Connecticut to North Carolina to start their very own farm where they are learning how to round up cows, out-smart goats, chase chickens, occasionally save pigs from drowning, and much more. Evelyn writes about their fun-filled adventures on the farm's website: TheWoolFamilyFarm.com.